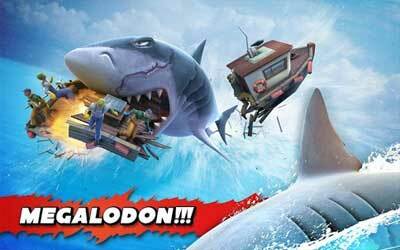 Hungry Shark Evolution APK 4.2.0 has just been released after its success in iOS platform. The game is developed by Future Games of London. In Shark Evolution, players act as shark that is constantly looking for foods to eat. The game consists of 60+ missions to complete, 5 kinds of sharks to upgrade and excellent 3D graphic. Players can feast whatever creatures are in the sea, from sea creatures, turtles, swimmer to fisherman. The ferocious shark will grow as it keep eating whatever in its way. This 3D game requires device with at least 1GB of RAM, Mali 400 and 86 minimal space. Not all sea stuffs are good for the sharks. Jellyfish, mines and other sharks are not good for the shark and will create a havoc. Players can collect coins to upgrade the shark like the bite, the speed as well as pimp the shark with gadget to boost its ability as well as styles to improve the shark appearance. The game is addicting since it lets players to roam freely looking for prey with many traps and obstacles. The game is build in 3D graphic, giving an even gruesome experience as it display detail quite clearly and no apparent lag for the game to run fluidly. The downside of the game is the expensive charge to buy gems. While the game is free, to unlock some customizations will require extremely huge amount of gems and it needs real money to buy it. It may make the players who do not pay will experience a slower pace of game. There is also no online save data feature to transfer game progress when log in to other device. Overall, this game is worth to try, some purchases may needed, otherwise Hungry Shark Evolution for android is free. A huge free-roaming world to explore! Tune in for our regular events to get your hands on limited time prizes! The NEW Narwhal has arrived with an amazing ability never before seen in Hungry Shark! Summer has arrived which means sport is in the air! Events all month long for all you athletic sharks! New special enemies to find and chomp on!